Full-time Access employees enjoy such benefits as 401(k) matching, regular company parties, at least 15 days of PTO, parental leave, membership in the nation’s largest employee discount program, and more. Access Development is pleased to announce it has been recognized as one of Utah’s top places to work by Utah Business Magazine in its annual “Best Companies to Work For” awards. 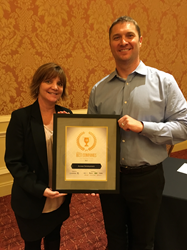 Access was honored along with other winning companies in a December 7 ceremony at the Grand America Hotel in Salt Lake City. Utah Business Magazine’s “Best Companies to Work For” honors are based on a combination of anonymous employee surveys and expert analysis of workplace culture, including management, structure, benefits, compensation, engagement, and more. Fifty companies across the state of Utah were selected. Access earned the distinction based on its employee-friendly atmosphere, recognition programs, flexible working arrangements, diversity and commitment to the local community. Full-time Access employees enjoy such benefits as 401(k) matching, regular company parties, at least 15 days of PTO, parental leave, membership in the nation’s largest employee discount program, and more. The recognition is Access’ fifth workplace honor in the past 12 months. Last month, Access was named the best midsize employer in Utah by the Salt Lake Tribune, and earlier this year the company was recognized as a Healthy Worksite by the Utah Worksite Wellness Council. Access is also a winner of the 2017 SHRM When Work Works award, and was named Utah’s Most Psychologically Healthy Workplace by the Utah Psychological Association in late 2016. For more information on Access Development’s workplace, culture, and open positions, please visit https://AccessDevelopment.com/careers. For over 30 years, Access Development has helped organizations connect with their customers and build revenue, engagement and loyalty through custom incentives, employee benefits, and discount programs. The company’s private discount network of over 300,000 merchant locations is America’s largest, providing discounts of up to 50% on everyday items to millions of end users. Access also offers the nation’s largest mobile commerce platform, featuring over 200,000 merchants offering exclusive “show your phone” mobile coupons. For more information on Access, please visit http://www.accessdevelopment.com or follow us on Twitter and LinkedIn.